Anon. Sale, Dorotheum, Vienna, 26 May 1955, lot 28, as Ferrarese Master c.1480, where purchased by Julius Priester, and thence by descent. 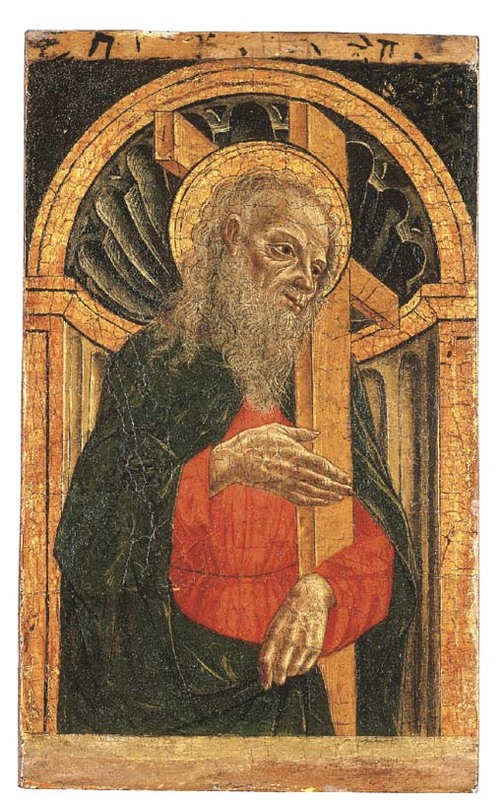 The present painting is a recent addition to the small body of about fifteen works given to the anonymous Lombard artist, the Master of the Pala Sforzesca, named after an altarpiece painted for the Church of Saint Ambrogio ad Nemus, Milan on the orders of Ludovico Sforza, il Moro, Duke of Milan. Executed in 1494, the altarpiece, which depicts a Madonna and Child enthroned with the four Doctors of the Church and the family of Ludovico Sforza, is now in the Pinacoteca di Brera, Milan. Although there is still some debate over the artist's oeuvre (for which see Pietro C. Marani, in The Legacy of Leonardo. Painters in Lombardy 1490-1530, Milan, 1998, pp. 179-198), the master's works generally show the strong (and often contrasting) influences of Foppa, Bergognone and Leonardo da Vinci, as well as those of artists working in Ferrara circa 1475 (the latter perhaps explaining the attribution of this work in the 1955 sale - see provenance). The composition of the present work--with the saint depicted half-length in a classical niche with a scalloped semidome--can be found in the Saint Paul (National Gallery, London) and in five oval paintings in the Castello Sforzesco, Milan, all of which Marani dates to circa 1495-1500 (op. cit, p. 193, and figs. 64-69). We are grateful to Mr. Everett Fahy for suggesting the attribution to the artist.